Write more and often. This is an how can i order accutane online Open Thread. The singer whose birthday is Monday or Tuesday – Nelson says April 29, the state of Texas claims April 30 – occupies a unique space in America’s cultural memory. A walking bag of contradictions, he wears his hair long in braids and has a penchant for pot smoking, yet remains arguably conservative country music’s greatest songwriter. He’s accepted by left and right, black and white and is instantly recognizable to a majority of Americans. Like few other music stars, his image has grown to represent more than the notes he’s played or the lyrics he’s written. Like Elvis Presley, Johnny Cash or Frank Sinatra, he’s become a figurehead for a uniquely American way of thinking. He represents the outlaw and the maverick. If Elvis was all about the pelvis and the sexual revolution, Nelson is American independence: the raised middle finger tossed with a twinkle in the eye. Willie’s activism has brought attention to such causes as small farmers, organizing Farm Aid in 1985 along with Neil Young and John Mellencamp that still raises money for small family farmers. He is also the co-chair of the National Organization for the Reform of Marijuana Laws (NORML) advisory board that supports its legalization, regulation and taxation. Willie’s activism doesn’t end there. He has support and invested in biodiesal, the better treatment for horses and the LGBT movement calling for the repeal of the Defense of Marriage Act (DOMA). Happy Birthday, Willie, and many more. This is your morning http://maientertainmentlaw.com/?search=discussion-propecia Open Thread. Pour your favorite beverage and review the past and comment on the future. Find the past cialis generico spedizione dall'europa “On This Day in History” here. On this day, two events occurred involving the South Pacific. Separated by 158 years, one was a mutiny, the other a grand adventure. 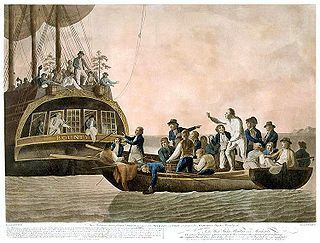 Apr 28, 1789: Mutiny on the HMS Bounty Mutiny on the Bounty: The mutiny was led by Fletcher Christian against the commanding officer, William Bligh. The sailors were attracted to the idyllic life on the Pacific island, and repelled by the alleged cruelty of their captain. Captain Bligh and 18 sailors were set a drift in the South Pacific, near the island of Tonga. Christian along with some of the mutineers and native Tahitians eventually settled on Pitcairn Island an uninhabited volcanic island about 1000 miles south of Tahiti. The mutineers who remained behind on Tahiti were eventually arrested and returned to England where three were hanged. The British never found Christian and the others. Captain Bligh and the 18 others eventually arrived in Timor. Years later on 1808. am American whaling vessel discovered the colony of women and children led by the sole surviving mutineer, John Adams. The Bounty had been stripped and burned. Christian and the other 8 mutineers were dead. Adams was eventually granted amnesty and remained the patriarch of Pitcairn Island until his death in 1829.
source link 1947 Thor Heyerdahl and five crew mates set out from Peru on the Kon-Tiki to prove that Peruvian natives could have settled Polynesia. His crew of six fellow Norwegians set sail from Peru on a raft constructed from balsa logs and other materials that were indigenous to the region at the time of the Spanish Conquistadors. After 101 days crossing over 400 miles they crashed into a reef at Raroia in the Tuamotu Islands on August 7, 1947. 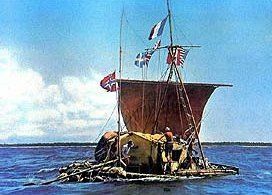 Heyerdahl’s book, “The Kon-Tiki Expedition: By Raft Across the South Seas”, became a best seller, the documentary won an Academy Award in 1951. The original raft is on display in the Kon-Tiki Museum in Oslo. Heyerdahl died April 18, 2002 in Italy. In fact there was no life at all. Scientists now believe life began in a far more hellish environment than some kind of Frankenstein laboratory with lightning somehow creating life in primeval soup. Most likely life was created by thermal vents deep in the lightless, airless recesses of the ocean. Cracks in the ocean floor opened to a hellish heat created by nuclear fusion that will continue until a dying sun engulfs the earth. Today such vents are still alive with alien life that cannot survive the sun and oxygen-rich environment of the surface. Anaerobic archaebacteria created that oxygen-rich environment from the poisonous methane that filled the atmosphere and then died from their handiwork. Nitwits who call themselves environmentalists and pay no attention to science would return much of the stored methane to the surface and the atmosphere and call it clean energy. They revere the distant sun, which will eventually destroy the earth, with its relative dribble of sometime energy and mostly ignore, or even denounce, the massive energy available from Mother Earth herself and her prodigious production of vegetation. These fine folk even prefer to fill the land and waters and air with their own waste rather than recycling it for energy. What kind of environmentalism would that be?